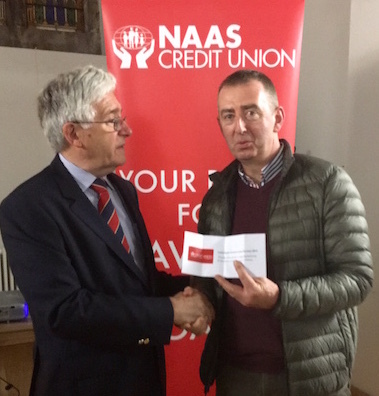 The school has been awarded €1,500 in this year’s Cecil Doyle Naas Credit Union Community Bursary awards. The monies are to be used towards replacing the school’s aging WiFi system to improve and extend access to all classrooms. Thursday 26th November at 1pm: Naas Credit Union will return to school for School Savings Scheme for pupils from 2nd to 6th class. New application forms available from the office. Wednesday 2nd December: Fair Trade Demonstration Day – the Greenschool Committee will give talk on fair trade products at the Community Coffee Morning in Rathmore Community Hall. The talk is to raise awareness of fair trade products and will go towards our 6th Green Flag. Wednesday 8th December at 11.30am: Mass in school – all welcome. Thursday 10th December: Christmas Fare in Rathmore Community Hall. 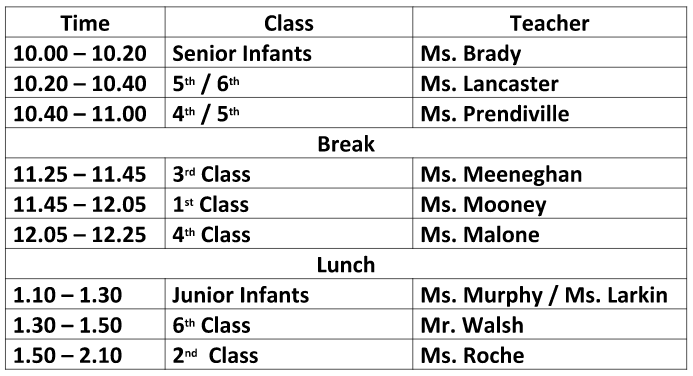 Monday 14th December from 10.15am: Junior Infants MMR Vaccinations. Tuesday 22nd December at 12.30pm: School will close or Christmas Holidays. Wednesday 6th January 2015: School reopens on for all pupils. Wednesday 6th January at 11.30am: Mass in school – all welcome. Thursday 11th February: First Confessions in Eadestown Church. (Time TBC). Children are not allowed to walk down to the Car Park / Rathmore Community Hall on their own for collection. We would also ask that children are supervised in the car park at collection times until they are safely in your car, as cars/buses are driving /reversing etc and visibility can sometimes be poor due to weather conditions. We would also ask that children do not walk through the flower beds but use the footpaths provided, that they do not run across the roundabout, and that they do not swing/climb on the flag poles, gates or bollards. Details of bus routes and contact numbers for the companies and drivers can be found by clicking HERE or from the About Us menu above, under Transport. Please note that this information is being provided for the convenience of parents and that the school has no responsibility for school buses.